BlackBerry Curve Ringtones and BlackBerry Q10 Ringtones are just in your hand. Bigasoft BlackBerry Ringtone Maker for Mac, the professional Mac BlackBerry Ringtone creator software, can easily make ringtone from music library, boost or lower ringer volume to any desired level, and then directly transfer the new created ringtone to BlackBerry memory card via USB cable for Mac users. 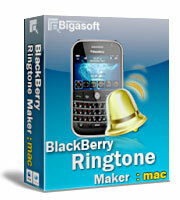 The Mac BlackBerry Ringtone Maker is available for all Blackberry phones like BlackBerry Q10, BlackBerry Curve and more. The powerful Mac BlackBerry ringtone maker helps you make custom ring tone from unlimited audio and video files including APE, MP3, WMA, WAV, M4A, MP4, MOV, AVI, MPEG, WMV, DivX, H.264/AVC, AVCHD, MKV, RM, XviD, 3GP, RA, M4A, MOD, TOD, MTS, WebM, VP8 and more to BlackBerry ringtones MP3. Besides, it allows you to adjust ringtone volume to any desired level for hearing your BB call wherever in a quiet room or in a noisy environment, and then transfer the new created ringtone to your BlackBerry memory card via USB cable automatically. 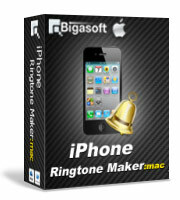 Free download Bigasoft BlackBerry Ringtone Maker for Mac and hear your own BlackBerry tone right now. 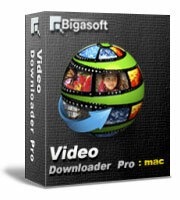 Ready to try or buy Bigasoft BlackBerry Ringtone Maker for Mac? 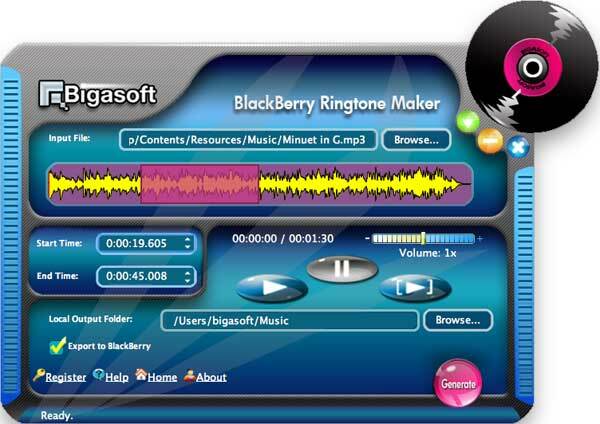 Bigasoft BlackBerry Ringtone Maker for Mac can easily create BlackBerry ringtone on Mac from any personal audio file including M4A, WMA, APE, WAV, FLAC, OGG, APE, MP2, VQF, AAC, AUD, AIFF (Audio Interchange File Format), CAF (Core Audio Format), and more. The magic Mac BlackBerry ringtone maker allows to make high-quality BlackBerry ringtone on Mac from any video file like AVI, MPEG, WMV, DivX, MP4, H.264/AVC, AVCHD, MKV, RM, MOV, XviD, 3GP, MOD, TOD, MTS, WebM, VP8 video and so on for BlackBerry users. It supports all types of BlackBerry models including BlackBerry Q10, BlackBerry Bold, BlackBerry Storm, BlackBerry Tour, BlackBerry Curve, BlackBerry Pearl, and so on. Just want a part of the music as your own ringtone? It can graphically display of music files to help you set exact start and end time of the segment to hundredth of a second. You can boost or decrease the ringtone volume as you like to any desired level for hearing your BlackBerry rings wherever in a quiet room or in a noisy environment. It will directly send the new created ringtone to BlackBerry memory card via USB cable automatically. The smart Mac blackberry ringtone tool offers you super concise and intuitive user interface, only in one click, you can easily hear your own BlackBerry tone. The professional Mac BlackBerry ring tone maker is fully compatible with Mac OS X 10.4(Tiger), 10.5(Leopard), 10.6(Snow Leopard), 10.7(OS X Lion), 10.8(Mountain Lion), and 10.9(Mavericks). Mac OS X v10.5(Leopard), 10.6(Snow Leopard), 10.7(Lion), 10.8(Mountain Lion), or 10.9(Mavericks). Memory card must in your BlackBerry smartphone.